In the year 2000, nations from throughout the world formally joined together with the common cause of eradicating extreme poverty. Their work has been guided and held accountable by, first, the eight Millennium Development Goals (MDGs, 2000-2015) and, now, the seventeen Sustainable Development Goals (SDGs, 2016-2030). 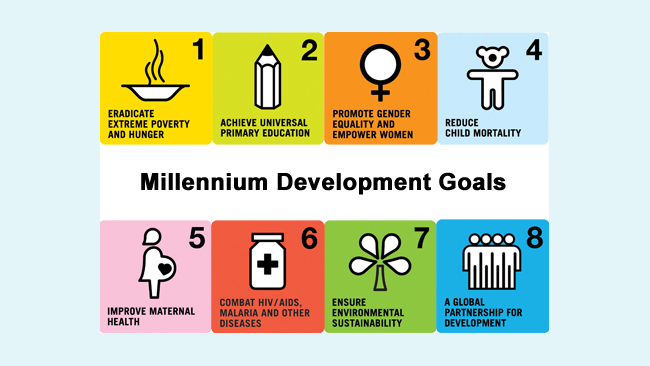 The Sustainable Development Goals, also known as the Global Goals, are listed at the end of this document. In response to the vow made in our Baptismal Covenant to “strive for justice and peace among all people,” The Episcopal Church has dedicated 0.7% of its annual budget to support the achievement of the MDGs/SDGs since 2006 and has charged each diocese and congregation to do the same. In our own diocese, the Diocesan Global Goals Task Force, which is charged to create a Diocesan-wide movement to promote awareness of the seventeen Sustainable Development Goals (SDGs) and to help congregations develop plans to assist in their achievement, oversees the distribution of this 0.7% through the Global Goals Matching Grants program. Since the beginning of the Matching Fund, participating congregations and organizations have enabled upwards of $13,000 annually to be distributed to a variety of organizations which are fighting extreme poverty beyond our borders. In 2016, grants were given to 18 parishes, totaling $16,985.76, furthered God’s work among the poor: Episcopal Relief and Development Commission to Every Nation The Diocese of Ecuador (for disaster relief) Foundation Cristosal, El Salvador Global AIDS Interfaith Alliance (GAIA), Malawi Good Shepherd Home, Cameroon Good Shepherd Sustainable Learning Foundation Heifer International International Justice Mission Redemption School, Haiti Tropical Clinics World Vision What is The Global Goals Matching Grant Program? The Global Goals Matching Grant Program encourages congregations in the Diocese of New Jersey to support the eradication of extreme poverty by providing matching funds for projects supported by the congregation. A grant of up to $750 per project is available to match funds raised and donated by the applicant. The applicant decides which partner organization to support and may request matching funds for either an ongoing or a new project. Each project must address at least one of the SDGs in an international location. Congregations can apply for more than one grant.